Headlines about this have caught my eye over the last week - I paid attention because I love Amy Shumer as a comedian and admire her as a feminist voice in a very male orientated industry. She's irreverant, outspoken and hilarious and hits the nail on the head in so many ways. Train Wreck was an entertaining movie but not her best vehicle - for outstanding comedy genius you have to see her 'Twelve Angry Men' sketch or 'Her Last F**kable Day' sketch. She's also best buddies with Jennifer Lawrence, another stellar female figure that I have admired for her outspoken response to Hollywood's stereotypes. However, my respect was tarnished a little bit this week by her response to Glamour magazine's featuring her in their 'Chic at any Size' issue. As you can see from the cover above, her name is mentioned under the headline 'Women who Inspire Us', alongside Adele, Ashley Graham and Melissa McCarthy. First up - I don't buy magazines like this because I don't think that they are a positive influence for women as a whole. And indeed, why wouldn't they inspire us? Adele, a phenomenally talented and successful singer and pretty nice person too it seems. Melissa McCarthy - an incredibly funny and talented actress, also successful. Ashley Graham - a hard-working successful model, who has spoken wonderfully about body image and who has also participated in humanitarian missions to South Africa and designed her own lingerie range. Yet Amy's first response was to dissociate herself from these women. This particular magazine issue is targeted at women of a size larger than the usual magazine models and these women have been described many times in the popular media as 'plus-size'. Amy was quick to jump in and qualify that her own size is a US 6-8. I don't think that anyone was in danger of seeing Amy as 'plus-size'. It's clear that she is a different size and body shape to the other women, yet her haste to separate herself from them is more reflective of how she views the size issue. Regardless of her claiming to be a proponent of body positive imagery and how we need to move away from describing women in these terms, her reaction left a bit of a sour taste in my mouth. She is essentially buying into the judgement of women based on size and appearance. Would there ever be a similar magazine issue featuring men? It seems unlikely! We are so conditioned, as women, to expect to be object rather than subject, that this kind of scrutiny and judgement seems normal to us. We tear apart and comment on other women's appearance as if it's an ok thing to do. All we are doing is bolstering an unequal perception of women in society - devaluing achievements, personality, qualifications in favour of the latest hairstyle or weight goal. Cindy Leive, the Editor-in-Chief of Glamour, responded by saying that they had featured Amy as an inspiring voice and positive body image proponent. Having read the tweets, they certainly rang true to me and honestly, I'd be very happy if I was put in the same category as the other women mentioned because regardless of what size they are, they are phenomenal human beings. It is obviously difficult to be under scrutiny when you are in the spotlight and the media uses appearance as the main focus for representation of women. But by us accepting and being complicit in this, we are allowing the inequality to continue and I feel that the response from Amy could have been a little more graceful. What do you think? I'd love to hear your opinions! Yes, totally! I was very disappointed in Amy and her attitude. Yes, this has been going around the internet and have read about it. I so agree with you. It is rather disappointing that she saw this in a bad light and you would think that being a celebrity, she'd be used to getting included in lists like this one. I bet if they put her in the "Top Ten Sexiest" or something as inane as that without asking her permission, she wouldn't complain. Yes, that was really what I was thinking too! Hmm I'm not sure - I kind of read it as "they wrote about plus size women who inspire us, why couldn't they have one of them on the front cover to show a clear message that women at any size can be inspirational and on a mag cover." I didn't really see it as "but I'm not plus size, don't think I should be associated with that". 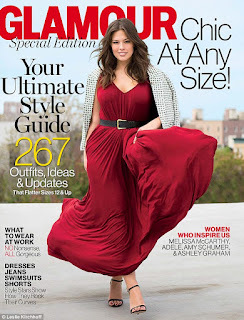 I think her intention was to say it's not good to have "plus size" over the head of a woman who isn't because it sends a mixed message - do younger girls reading this she a woman who is a US 6-8 (UK 12 I think) and see that as plus size as opposed to the usual US 2 which is on covers. If she did mean it in a derogatory way I think thats sad - media should be used to encourage all body types and diminish stereotypes. Well I suppose the fact that she wasn't actually called 'plus size' was my issue - she was simply listed under the 'Women who inspire us' category and although it was an issue for women of all sizes, there wasn't any picture of Amy on the front, just a line saying that she was inspiring. She was very quick to dissociate herself from the other women and in fact it was Ashley Graham pictured on the cover, who is stunning anyway but larger than models would be normally. I am not one for reading magazines, but I wish we can stop this unhealthy obsession about size. It seems as though she jumped to conclusions without thinking. Clearly the article was not about size at all and all those people mentioned are role models! yep,,, in total agreement .. to cut to the chase she didn't want to be seen as the "fat" girl.. and dealt with it the wrong way.. the obsession with size continues.. This is never going to end especially in the fashion industry. Size is always been the matter. However she should have think it through. I have no idea who Amy is, but I'd have thought any publicity and chance to be in a magazine like Glamour would have been a good thing. I can see what she was probably trying to say with it being a plus size edition you'd expect everyone to be so especially in an article about inspiring women, but I don't think she really needed to comment. Well written Cliona and good point!! No woman should be defined by her size be she little or larger, but by her ability to live a successful and happy life. I do agree Kathryn, we shouldn't be defined by size and how we look!